I was looking for a Sunday lunch in London to meet our friends – Phil, Abi and their (almost 2 year old) son, Joe). 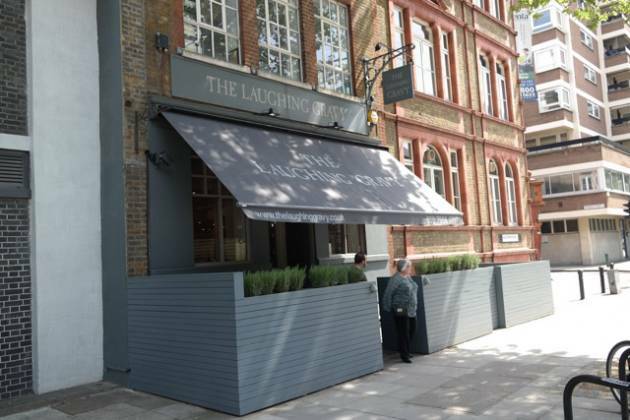 After much searching, I found The Laughing Gravy in Southwark. It took us a lot longer to get there, due to my poor planning and the wonderful TfL engineering works! So, we were actually 30 mins late. Phil et al were ok about this thankfully, relaxing in the plush leather seating area with a drink. There were two window ledges of books, so one could sit with a drink and relax. The decor was trendy / industrial with bare walls and a conservatory roof (making it very light – a good thing). The tables were laid out with linen napkins. Fun paintings adorned the walls which were available to buy. I had a bottle of hoegarden waiting for me (thanks Phil), Claire ordered a glass of house white. They had quite an extensive wine list, but only two drinks on draught – Camden Pale Ale and Camden Red (I think). I had a pint of the pale ale, which was nice, but would perhaps prefer a larger choice if it was my local. With the meal, free table water was provided. Unfortunately, due to my tardiness, starters were out of the question which was a shame as I was very tempted with the home-made black pudding scotch egg! Claire and Abi ordered the roast chicken, Phil and I went for the beef. They did not offer a children’s roast dinner, so Claire asked for an extra serving of roast potatoes and we would share our meal with JW. Lunch came out quite quickly. Thick strips of roast beef, with 3 roast potatoes, cabbage, parsnips and carrots, along with gravy. The roast chicken was a supreme (ie a breast of chicken on the bone), and sliced. Tucking in, what can I say? I can never order a roast beef again, it was by far the very best I have EVER had! Charcoal taste on the outside, medium rare in the middle with such wonderful flavours, and so moist too! All future roast beef reviews will be compared to this one. 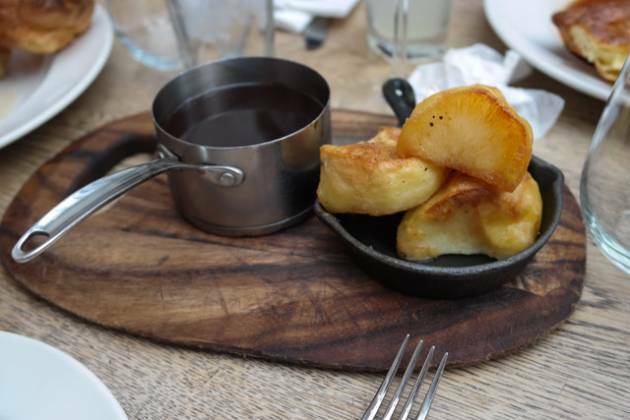 The roast potatoes were great, wonderful flavours. 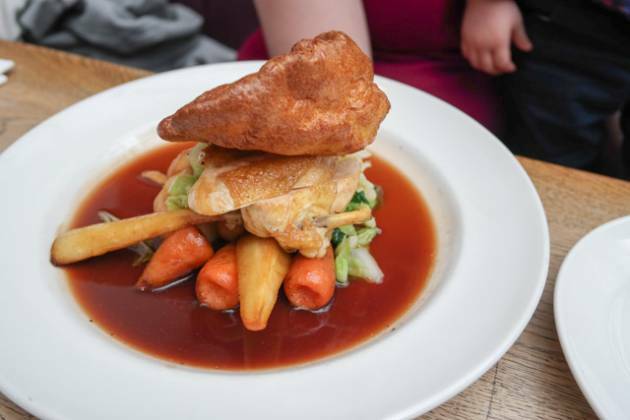 Vegetables received a seal of approval from JW, munching away on a roast parsnip ;-) Lastly, the gravy (jus) – thin and full of flavour. I was very surprised to see that they had a table in the male toilets to change a baby. As the restaurant was quite small, they did need to take the push chairs out the back, but this didn’t inconvenience us at all. They didn’t have a children’s roast, so we (I mean Claire) shared some of her chicken with him (as mentioned above). The high chairs were clean and sturdy. So, whilst it wouldn’t be suitable for a lot of children, it was perfectly fine for us and we were not made to feel uncomfortable. We all thoroughly enjoyed our visit to The Laughing Gravy in Southwark. The staff were friendly and helpful, the venue itself was good, with it’s upmarket industrial feel. The roast beef was amazing, I’m keen to go back just for that! The rest of the roast was good, with the roast potatoes also receiving top marks. It would be good if they offered a smaller roast dinner for children, I’m sure it would be popular. 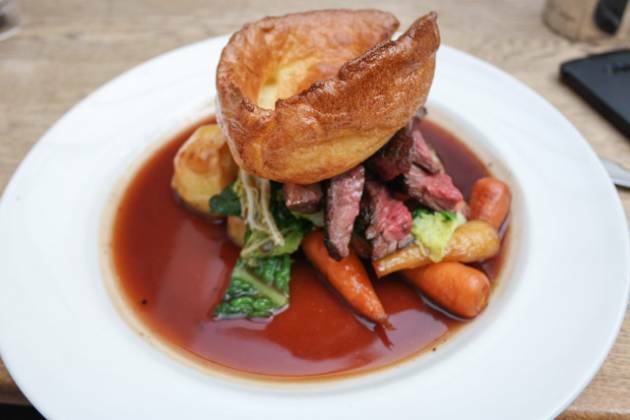 As it stands though, a top rated Sunday lunch for The Laughing Gravy and I can’t wait to go back again!